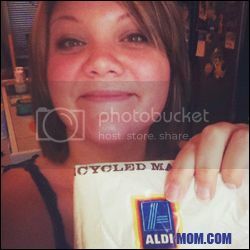 AldiMom: Aldi reviews, Aldi recipes, and more! : Why Shop at Aldi? Why should you shop at ALDI? Is it wise to pay 4.99 for an item, that you can get for 2.99? If the ingredients are the same, is it really that much different? Is it worth it to you, to try something just once, if it could save you thousands per year? Would you rather give your money to a company that could careless about your opinion, or to a company that actually cares about the well being of their customers? They care so much, they take your ideas and comments into consideration, and they also provide a product guarantee? If you don't like their product for any reason at all, you can return it for a full refund. If you drink milk from a cow, is the milk from another cow raised and fed the same way any different? What if you can get it for half price? Doesn't that make it better? What about for the fact that they also don't use growth hormones on their cows? And their milk contains no BGH! Need more convincing? I dare you to buy your family's groceries for the week at ALDI, just one time. If you don't like it, so be it. Isn't it worth a try? A family of four on average, spends around $500.00 a month at a National Brand grocery store. This equals $6,000.00 per year on food alone, not including household and everyday items. Switch & Save with ALDI and you could be saving $3,000.00 per year or more on just food. ALDI also carries diapers, baby wipes, laundry soap, pet food, lotions, medicines, toothpaste, toilet paper, paper plates, trash bags, vitamins, seasonal items, and more. All their items are just as good as National Brands or better. How do I know that ALDI products are tested to be great products? During a visit to ALDI headquarters, I visited the ALDI test kitchen. What is the test kitchen? ALDI products go through a significant amount of quality and taste testing to get their products tasting just as good, or better than the leading national brands. These aren't just poorly, quickly made products out to make a buck. ALDI genuinely tries to make an excellent product. Why is the cost of ALDI products so low? 1. They don't have to pay a large group of employees because the cashier's take part in all jobs. Janitorial, Stocking, Receiving, Quality Control, etc. They also are paid more and receive cheaper benefits than your average grocery store employee. 2. Checkout is more efficient because produce is sold by the unit--nothing is weighed, which takes more time. The packaging is covered in bar codes, cashier's do not have to look for the code and keep trying to get it to beep through the machine. 3. There are no fancy shelving, everything is stacked in delivery boxes. However, you will notice the design of the boxes matches the design on the product packaging. Cute. 4. Restocking for the employee's is a cinch. They open the box, stack the box. Hundreds of new products are restocked in a minute. Other grocery stores can't do that as fast because they restock each individual item. 5. The crazy car system. :D Employees don't have to wonder around parking lots gathering carts, and you don't have to worry about your car getting hit with one! Pop in a quarter, get your cart, return it, get your quarter back. It's a pretty smart process if you ask me. 6. ALDI only carries 1400 of the most commonly purchased products. Yes, your cereal bars might not come in lemon, cranberry, vanilla, or chocolate...but they will come in the most popular flavors--strawberry, apple, and mixed berry. Having the most common types of products helps ALDI save money, which gives you lower prices. 7. ALDI makes all of their own products. This way, they don't have to pay suppliers and other distribution centers to stock products. They do everything themselves, and every ALDI has their own distribution center close by. If they are out of something, they call the center and get more. If you have any questions at all, feel free to contact me, or contact ALDI themselves. They have friendly customer service and are always around to help you live better. Disclaimer: Once again, I would like to note that I am not endorsed by ALDI to deliver my opinions to my readers. I am passionate about ALDI, and I truly believe this company can help us all live much better in this expensive economy. As of late the drawstring on the 13 gal tall kitchen bags are breaking. they are not as reliable as they were a year or so ago. I thought you would like to know or maybe not. I am not over filling the bags. I will continue to buy them in hopes that they will be improved.